A cooking blog for college students! There will be simple recipes, helpful cooking tips, and musings about anything related to cooking. Everything in this site is from my experience, so if you have any comments regarding my cooking and methods, let me know. Did anyone learn something new? 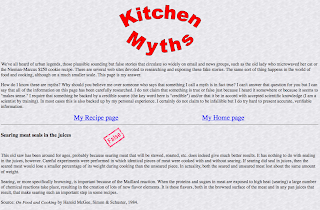 Do you know any cooking myths you know are false? I thought searing meat sealed in the juices and I also thought baking soda absorbs orders. I'll have to check out the website. Melbourne Escortbuying salvia I thought searing meat sealed in the juices and I also thought baking soda absorbs orders.